David Breashears is some guy. As if scaling Mount Everest five times wasn’t enough to be going on with, he’s also found time to snap enough photos to create a stunning two-gigapixel image of the world’s highest mountain and its surroundings. It’s a remarkable piece of work that allows you to zoom in to see the Himalayan landscape in incredible detail. Filmmaker and climber Breashears used a camera with a 300mm lens to capture the 400 or so images that make up the panoramic photo. Mount Everest can be seen to the left of the middle of the stitched image. 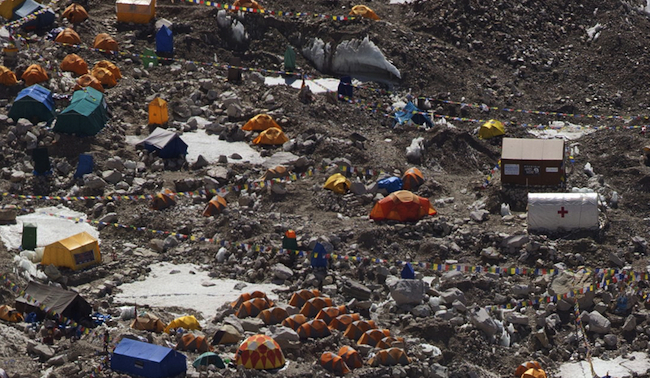 Zoom in close enough and you can easily see individual tents and climbers at Base Camp. Other parts of the image show climbers on Mount Lhotse, the world’s fourth highest mountain. The image forms part of a project by the 57-year-old climber called GlacierWorks that aims to show the way the changing climate is affecting the Himalayan region. Breashears says when images shot today are compared with others taken in the first half of the last century, it’s clear to see the glaciers in the area are retreating. “There are over 49,000 glaciers throughout the greater Himalayan region, and most of them are showing dramatic and accelerated melt rate,” he told Block. If you’ve always fancied a trip to the Himalayas but don’t have the winter wear or wherewithal, click here to explore an extraordinary image that will make you feel like you’re actually there. UK 4G LTE spectrum auction attracts new players, but will a new mobile network follow?